Juanita Venter beat the world’s top veteran cyclists to claim gold in her signature event on the first day of the UCI Amateur Road World Championships in Slovenia yesterday. 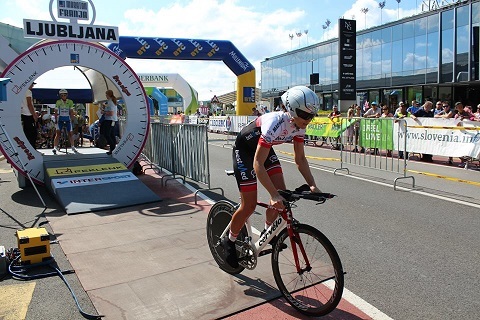 The South African time-trial champion set a solid pace on the streets of Ljubljana to cover the 18.6km out-and-back course in 26:53.2 and claim the world champion’s rainbow jersey in the 35 to 39 age group. The Bestmed-ASG rider also finished third overall on the women’s podium behind the United States’ Molly van Houweling (40-44) and Slovenian Danijela Svetik (19-34), who stopped the clock in 25:31.7 and 26:35.8 respectively. Venter said she was thrilled to have taken the gold in her very first international competition. “I’m honoured and humbled by the overwhelming support I got from my family, friends, sponsors and the cycling community,” she said. According to Venter, she had decided beforehand to take the opportunity to appreciate the experience, ride the best race she possibly could and have no regrets afterwards. The 38-year-old said the flat course had suited her quite well although she would have preferred a more undulating route. “Going out we had a headwind and I battled to keep my speed above 40km per hour. With the wind at her back, she put the hammer down and pushed her pace up to an average of 45km per hour. Venter has been on top time-trial form this year, winning the solo event at both the Bestmed Tour de Boland in March and the Lowveld Tour in August. The Pretoria resident, who is also the national road champion in her age category, will now turn her attentions to Sunday’s 156km road race. Bestmed-ASG team manager Owen Botha said, as captain, Venter was a role model to the younger riders on her team. He said her junior teammates Monique Gerber, Michelle Benson and Catherine Colyn would draw inspiration from her victory ahead of their own participation in the UCI Road World Championships in Spain at the end of September.